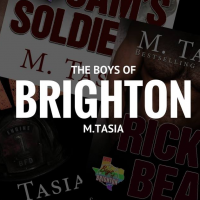 M. Tasia, is an author who lives in Ontario, Canada. Michelle is a proud member of the Romance Writers of America and its chapter; the Toronto Romance Writers. Michelle is a dedicated people watcher, lover of romance novels and 80’s rock, who grew up with a love of reading. She is a firm believer in happy endings, romance, intrigue, and sizzling hot love stories, since love is meant to be celebrated and shared.